The lock-back knives also require some maintenance from time to time. The difference on a lock-back is to use a bit less oil. Some also use some oil on the lock-itself with the cut section of the tang vs. the spring. The most important with a lock-back mechanism is to keep it clean from dirt and substances. It is smart to use some oil for the blade so it moves freely opening and closing. It can also be smart to use some oil on the pivot so it moves free without much friction. You can also use some oil inside the construction for the friction part for the spring that causes tension. I know that there are different philosophies out there on oil and some disagree. The key is just to use a little less than normal. Cleaning the Hunter Pro can be done in the same fashion as regular SAKs with water and moving the parts. It is smart to use food safe oil on Hunting knives. In my experience I have never had problems using oil on the places marked X. Remember to keep the edge sharp all the time. It is an impressive knife! from experience it is smart to use fine Diamond stones or Natural stones With a fine surface. In my experience with lock-back knives from the world i have never had any problems with some oil on the friction parts marked X. This knife is just for my collection. It is also from experience i recommend using food safe oil for hygiene and because it secures functionality. Another important factor is that it actually helps cleaning. When you use warm hand water the oil will distribute and the substances follows. When you move the parts under water the substances will also come out. Oil on the friction parts will secure the durability and quality. Dirt and substances in a mechanism can cause damage. On the Hunter Pro the parts are so solid that it can take the extra. The functionality will be less when dirty. The surface on the friction parts on lock-backs will be smoother from use and wear. This is normal and unavoidable. 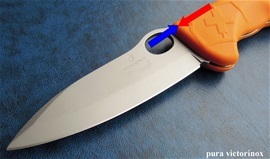 When you open and close the blade the backside of the tang will be in contact with the spring. There is a friction part that will be important. When you put some small amount on oil on the lock cut-part itself then the oil will also distribute there when you move the blade. Also the oil for the blade itself will distribute. Abrasive substances and dirt can cause unnecessary friction on the moving parts. The Swiss knives rely on precision, quality and tight construction for the functionality. The performance is very much related to this functionality + the safety! Maintenance is very important for the safety. There are things you can use to clean the mechanism with that can help to remove substances. A toothbrush, q-tip and small brush for paint can be useful. From experience I have used soap on SAKs without any changes to the materials. I usually rinse very much after hand warm water with soap. On lock-back knives for hunting purposes the hygiene is extra important. On such mechanisms most of the dirt and substances will develop at the tang area and the front part of the construction. When the blade and tang area get much dirt and substances then when you fold or open the blade it may fill the cut section for the lock in the tang. When the counter part in the rocker/lever spring shall snap into then it may fail. It may also cause the spring/lever/rocker to be almost in place and you can get accidental closing. The design of the cuts sections and counter section, the tang and spring, lever, rocker is in my opinion made to let moist + some substances to be squeezed out or in other words drain. Even so maintenance is important anyway. When i received my Hunter Pro there was a small amount of oil on it. First I will talk about some mechanical things and use. If you put pressure against the edge, in other words you press the blade edge against a surface then the forces works upwards and correct. See picture. Then because of the precision the forces will distribute on the lock, lever, rocker or spring. The Hunter Pro got a very thick rivet for the blade and this is important because there are forces working there during use. 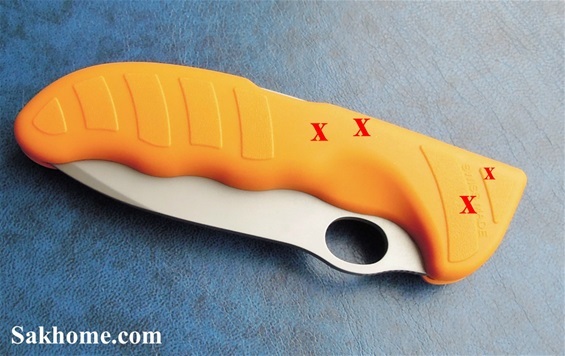 This knife is a heavy duty blade with stainless steel side liners and very strong rivets to take the load. It does not automatically say that because it is so robust that you all the time use force. Most cutting involves using the sharp edge and work correct and with a minimum strength. When you use it hard then the precision, design and construction on a lock-back knife secures the safety. The locking mechanism is important on a hunting knife because of the safety and also the comfort. If the edge sticks when backing out of a cut then the lock will prevent the blade folding. A lock-back is a full contact lock and it makes the complete construction firm. Also when you use the blade in reverse and for dressing of animals the tip will be used a lot. Most professional people would use the knife correct but for sure like I have explained at some point a locking mechanism must be present to call a folding knife professional. When you put pressure against the edge then there will be forces distributing on the lock spring and the rivet for the blade. During twisting motion that is also unavoidable then there will be friction between the tang of the blade, the lock spring and the sideliners with rivet. The oil between the tang and rivet for the blade secures a comfortable opening and closing of the blade. It also prevents unnecessary friction. During light use there is no or very little friction on the complete construction. During harder use the friction will become stronger. In a way a lock-back mechanism will have pressure on the lock both ways. The most important for safety is for sure pressure against the edge in the folding position. Maintenance will prevent folding that could cause injury. The lock-back is a full contact lock and this mean the design can be used for the tip of the blade dressing animals. An experienced person will in most cases use the knife as there is no lock at all. At one point it is unavoidable that a lock must be present. During harder task with a folding knife then a lock must be on it no matter what. On a lock-back knife the locking spring and spring for tension together with the full construction will be active all the time when the blade is engaged. I am self-taught with locking mechanisms. The durability on knives depends on maintenance. On folding knives and on lock-back designs it is very important that the rivet for the blade is strong. Victorinox use a massive rivet and I rejoice. In my experience with similar designs and mechanism i learned and by looking on used knives from other Brands that this part is very important. Not only that it is one of the rivets that holds the construction together it is also important for the durability, wear and to avoid play. If there is a very small amount on knives then this is not any problem. If there is play against the spring vs the tang of the blade, in other words the mechanism on such designs then there is a problem. A lock-back is not a slip joint with a secondary liner-lock to prevent accidental closing. Such designs are not full contact locks. "Maintenance will secure the construction over time and prevent unnecessary play in the rivet for the main-blade"
In reality it is actually not much maintenance and cleaning that is required on such knives. They are easy and great knives to have with you. Maintenance is fun and I enjoy it a lot.. Inside the construction from the side-liners there are two notches and this serves several functions. So during maintenance it can be ok to check it. On folding knives with such a configuration this act as a stop function for the blade when you fold it, there will still be some spring tension that holds the blade towards these notches along with the design. These notches also prevent unnecessary or accidental pressure caused by carry or other situations so the blades edge does not get pressed against the mechanism and springs. This can result in damage and that the edge gets damaged. The notches are there to prevent when the blade snaps into the handle construction with speed that the edge does not touch the springs. Many lock-back designs from the world use maintenance in the philosophy when they design them. By using the spacer and spring for the tension in one piece you avoid any parts breaking loose. It also helps for the cleaning. Another thing is one that many may forget is the distribution of forces. On some lock-back designs when you look inside it then then you can see that one part of the spring system may wander from the side or be in a strange angle. This is not so on the Victorinox design because the spacer that also is a continuation of the handle and is a spring for the tension is in one piece. As said there are several designs out there on knives from the world. Others also use the two parts for the mechanism. On some they use a spring for the tension and operating of the lever/rocker in a material that is very flexible but rather poor against corrosion. Another thing is that this bar or spring for the tension are sometimes fit against plastic handles and that the plastic holds it in one end. And that this spring wanders a bit from side to side in the handle. This could lead to a problem and also for the hygiene because of corrosion. "On many designs from the world it is used washers or discs to make the opening of the blade the best. It seems to me that Victorinox use the smartest thing by using the liners or side liner made of stainless steel with extension. It looks so but do not arrest me if not. It is typical Victorinox to do so anyhow. It does not look like there are any separate discs or washers. In some cases these can make it more difficult to clean and sometimes the washers are so thick that they cause a small play sideways as well"
Lock-back mechanisms works very well for large blades that got some weight. While liner locks can be used for some larger blades too. I feel the best for a large blade is a lock-back. I know about triad locks and axis locks and a good deal of others. My main interest is SAKs and for my use I can use slip-joints, slip-joints with liner lock against accidental closing and some lock-backs. I use some fixed blade knives too. It is very fun to study mechanisms anyhow and the durability and problems that may happen. Triad and axis locks are great. Some mechanisms may require more maintenance than others and some designs are made to be disassembled. Then you must know what you are doing. Folding knives are very useful and that can be carried secure in a pouch that does not take much space. The reason for why I mention some on the side about mechanisms is that I have never seen any folder yet that does not require some maintenance and I know that the durability and functionality depends on some maintenance. One good advice is to never leave any knife away wet or dirty for longer time. If you read and study sakhome.com you can see that most SAKs today use press fit handle scales. One of the important things with traditional SAKs is that we from time to time get a dynamic change to the construction of them. New designs are sometimes because of new possibilities in the production that allows new evolution steps. With new handle designs you can also get a dynamic change in the construction of the SAKs. The scale material itself can get new molds, designs and be made with production methods that were difficult and not cost effective before. In other words you open up new areas for the SAKs that refresh everything. By using press fit handle scales you can change them easy if damaged at the factory or people can change themselves. It is possible that one SAK can be available in many colors and with different materials. Handle colors and the look of a SAK has been a topic since the first Officer knife was introduced in 1897 and until today the appearance of it has seen a large number of methods for attaching the scales without visible rivets. Before press fit the complete knife had to be disassembled to change the handle scales. Maybe not all the time but I would believe it was the case many times. For many I would believe we are a bit strange for some that we can collect many similar SAKs only with different colors. There are a huge number of models and categories it is just that sometimes we can collect the same SAK only with different colors. To this I can say that different colors alone are enough to make the SAK different. It is not the same if the colors are different. So why do I talk about the press fit and materials used in the knives. Both Wenger and Victorinox are dedicated on new materials for the handle to improve the safety, design and appearance. Most SAKs can be used for Hunting and food tasks if you do some maintenance from time to time. Both Wenger and Victorinox made and make professional knives for kitchen and butchers in their history. This involves fixed blade knives with special handle designs for professional use. In other words tools for professional jobs in the kitchen and for butchers. There I know some very special handle materials has been tested and incorporated for the different handle designs, ergonomics and safety. It involves innovation for making handle materials that are hygienic, durable and very safe for use. It is about making a material that can be sealed in a way that makes the handle extra hygienic. There you can get surface changes on the handles that involve two materials for the handle. On some the surface is extra slip resistant and kind of rubbery or textured. They are also capable of being resistant to liquids used by professionals and to be washed at temperatures that are high. Many forget the science that Wenger and Victorinox used and use for professional knives. On the SAKs I could mention the 111mm Services Range and 130mm New Rangers we see the use of new materials, two component or dual density materials. This is to continue the comfort and safety. There are a few differences on the dual density handle materials that can be used in very cold environments. I am not sure they can take extra high temperatures. That is why i use water that is not warmer than what is comfortable for my hand. I use some soap and rinse very much after cleaning like I have explained. It is fully possible to have a clean 111mm that got many functions on it. No problem. On the Hunter Pro the surface and material called Polyamide that is a material we can read about on the internet. I will search the internet to see if I can find articles from Victorinox or tests done. The Hunter Pro is a professional single blade knife for hunters that are made to be used for everything. It will be interesting to learn in the future where this handle material fit in. Sometimes I would believe we can find materials used on SAKs to be found on kitchen knives and vice versa. I am a bit open for the material used on this knife so far. Today we live in a time that gives new opportunities for the production of handles. This we can see from 2004-2017 greatly. Wenger Evolution, EvoGrip, RangerGrip, Ap Blaze, Ap Snow, Realtree, soft touch, Mike Horn and many more. Victorinox with the New Soldier and other 111mm knives and now the Hunter Pro. There are more than I mentioned. In time you may change the handle scales on the Hunter Pro if necessary, this is also maintenance. They are press fit. The Hunter Pro is easier to clean because it is a single blade. It is ergonomic, comfortable and safe. If the handle materials are similar to some used on the 111mm I am not sure about. I know that technology today can do new things. I hope to find out some more because I like to learn more about knives and technology. Whatever the material is it is a very special surface feeling. I have like explained had a material on a handle for a fish/fillet knife but not completely. There are also some parts on the Hunter pro with extra slip resistant parts. It is one of the most distinct professional handles I have ever seen. Like you know SAKs can be used for food tasks. The kitchen and butcher knives are fixed blade knives but they also incorporate materials that are extra. On SAKs we see some of this philosophy with ergonomic shapes, safety and two component materials. The 111mm and Ranger 130mm are professional outdoors products that incorporate ergonomics, safety and materials in a greater way. So far before I know any more I recommend using hand warm water cleaning the Hunter Pro in the same fashion cleaning the SAKs. I hope all this text does not bore you handle scales has been my interest for a long time. There are variations on press fit in the history and press fit from liners and bushings. The Wenger EvoGrip, RangerGrip and Victorinox New Soldier and dual density handles are very strong and durable. The only part is not to use very high temperatures. I have never heard any negative yet. I am not an expert on the plastic or similar materials themselves, i do know that today we can get plastic handles with two component or a single component with very special texture. We also see a rubber material used in combination with Nylon. I also know that new production methods open new possibilities today. From 1961 Victorinox used hidden rivets on the SAKs but some still today got open rivets on the Officer line. Victorinox used hidden rivets before 1961 on the Officer knives. Wenger was into hidden rivets in the early 1950s and innovated different methods for hidden rivets. PS i have only good things to say from experience using Wenger and Victorinox handle scales in the outdoors and in salt water environments. Never any failure! I forgot to mention one other material used on the 130mm Hunter Pro knives and that is the wood edition. This is a hand bliss knife. 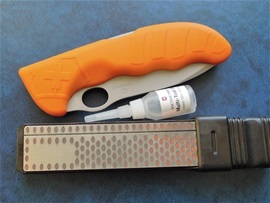 Both Victorinox and Wenger use glue for special handle materials. Some also use one of the strongest “double side tapes” in the world. Let me know if you know which used on the walnut wood Hunter Pro.